While staring you straight in the eye, far above the tips of her Toms, Josie Brant would swear that she does not like Peter Maxx, the teen sensation who causes every girl within a 100-foot radius to scream at ear-shattering decibels. Even if Josie may completely, totally, and unequivocally be his biggest fan. So when Josie finds out her best friend has won a contest to meet Peter by stealing one of Josie’s songs, Josie is overwhelmingly shocked and upsetsome of which flies out the window when Ashley introduces Josie to Peter as well. 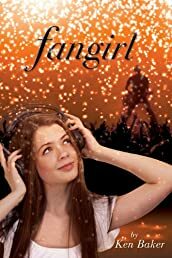 And suddenly, in a whirlwind of Tweets, IMs, texts, and phone calls, Josie finds herself in the middle of a flirtatious friendship that has the potential for complete harmony. But just when everything seems pitch-perfect, the paparazzi flashbulbs explode, along with any notion of a fairy-tale romance. Author Ken Baker, E! Channel’s Chief News Correspondent, uses his inside knowledge to craft a novel authentic to the teen pop idol experience with sincere heart and humor.